You will be able to apply tools to eliminate the distressing cognitive features of anxiety, such as rumination, catastrophic thinking, and cognitive errors with tools such as “Contain Your Worry”, “Worry Well and Only Once” and “Knowing, not Showing Anger”. You will be able to identify and correct for the typical issues of procrastination and perfectionism as they appear when caused by generalized anxiety disorder. But also, you will be able to apply the neuroscience of memory reconsolidation as it affects and directs both desensitizing panic cues and the creation of effective social anxiety exposures. Through case examples, description of methods that will include “Knowing, Not Showing Anger”, “Contain Your Worry in Time,” and 3 mindfulness practices to minimize distress. 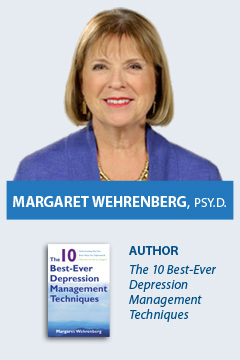 Dr. Wehrenberg will provide a look at the research that supports the efficacy of these treatment methods and give an opportunity to practice several of the methods, including 5 breathing techniques to manage anxiety, 2-minute relaxers, “Clear the Mind” of worry, the ‘Heart Lock-In’ from Heart math, and Emotional Freedom Technique, among others. This seminar is suited to any clinician who has clients with anxiety, and it will aid the newer therapist to be effective with anxious clients of every age as well as strengthen the skills of even the most experienced clinician. This workshop meets the educational requirements when applying for the Certified Clinical Anxiety Treatment Professional (CCATP) available from the Institute of Certified Anxiety Treatment Professionals (ICATP). Go to https://www.icatp.com/evgcert/certifications for details. To receive the early bird rate, registration and payment must be received by Monday, May 13, 2019.